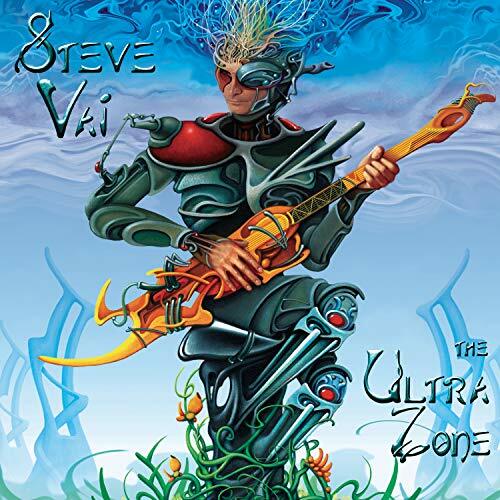 STEVE VAI - Guitar hero - ex-Frank Zappa - super riffer of eclectic jams - "Eclectic Earwig Reviews Music and More for You!" world guitar man like Mr. Vai. tongue than most can with their fingers. at times but it comes with the territory. Steve Vai's release The Elusive Light And Sound Vol. 1 is a compilation of tracks that were previously recorded for the soundtracks of the various movies for which Vai has composed music. Though the music spans a number of different movie soundtracks, the tracks are all characterized by Vai's progressive, hard-edged guitar work. There are no surprises on this CD and if you have seen any of the movies from which the tracks are from, you will recognize the music from those movies. The soundtracks also include some of the dialog from the movies that lead into Vai's guitar work. The CD features a lot of signature Vai axe work in the aggressive, biting Vai style of progressive instrumental rock. The legendary "cuttin' heads" duel from the Crossroads movie is included in the lineup of movie soundpieces. The Paganini caprice excerpt is probably the highlight of the compilation as a historical milestone where Vai demonstrated his technical capabilities and gained broad exposure to the general listening population with this segment from the Crossroads movie. (for those of you who are old enough to remember that!) It is kind of neat that you can now listen to this segment without having to sit through the movie to get to it, as is the case with any of the other tracks that you will now be able to listen to without having to pick them out of the movies. The "Celluloid Heroes" track is another highlight of the CD, though not lead guitar intensive, it is a well-produced track with good musical vision. By now, most of you probably are already familiar with Vai's stunt guitar work and composition. If you like Vai's studio albums, you will want to add this one to your collection to round out your Vai library. There is a lot of good guitar work by Vai on the CD. The only drawback is that some of the voice-overs from some older, goofy movies, like Bill & Ted, are included and you'll have to tolerate them to hear the guitar work that ensues or accompanies. 9-16) Music From "Bill & Ted's Bogus Journey"
17-18) Music From "Encino Man"
his idiosyncratic first solo record Flex-able (1984). concept solo album Fire Garden (1996). even a horn section on "Lucky Charms." deceased former mentor. The ballad "Windows to the Soul"
ferocious chops until the right moments. spoil the soaring mood that the previous track "Fever Dream"
musically above most of his instrumental guitar peers.